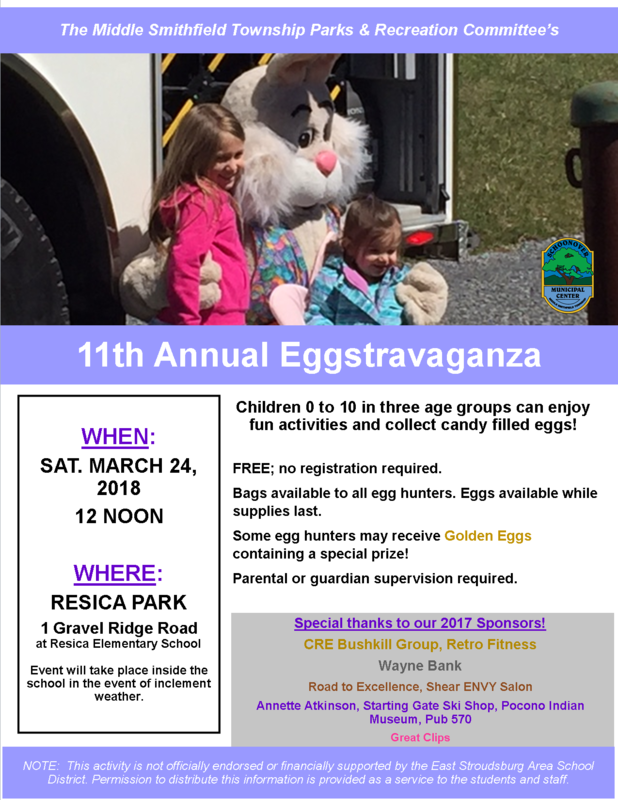 Middle Smithfield Township, PA: Middle Smithfield Township’s Parks & Recreation Board’s 11th Annual Eggstravaganza will be held on Saturday March 24 at 12 p.m., rain or shine, at Resica Park in East Stroudsburg, PA.
Come and join us for another hippity-hoppity time with thousands of eggs and a special return of the Easter Bunny. This year’s Eggstravaganza is the perfect chance for the whole family to have a great time. Children can participate in age groups 1-4 years, 5-7 years, and 8-10 years, in a series of activities to collect their eggs. Snacks and refreshments for everyone will also be available beneath the pavilion. Parent or guardian supervision is required for anyone under the age of 18. The Eggstravaganza is a great opportunity for residents to catch up with neighbors in friendly conversation. The kids and kids-at-heart of all ages are welcome and get a chance to win prizes and have lots of fun. Bags for the hunt will be provided by the township for all egg hunters. Eggs are available while supplies last! In the event of inclement weather, the event will take place inside Resica Elementary School. Resica Park is located at 1 Gravel Ridge Road next to Resica Elementary School. Please call 570-223-8920 x119 for more information, or email crain@mstownship.com. When: Saturday, March 24 at noon. Where: Resica Park, 1 Gravel Ridge Rd. East Stroudsburg, PA 18302. The Middle Smithfield Township Parks and Recreation Committee aims to improve the lives of the residents of Middle Smithfield Township by providing safe, welcoming parks and diverse recreation activities for people of all ages. The Committee is dedicated to maintaining the beauty and character of the Township while creating a safe haven for the Poconos’ signature wildlife and native flora. By working closely with other Middle Smithfield Township groups, MST Parks and Rec will ensure safe open space environments for residents to enjoy. Those interested in joining should email parks&recreation@mstownship.com.